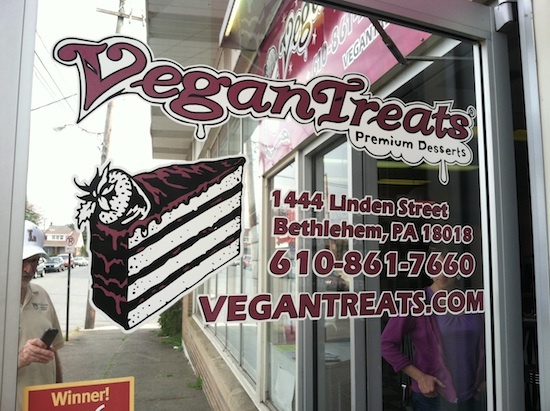 I have a feeling that Vegan Treats doesn’t need an introduction. 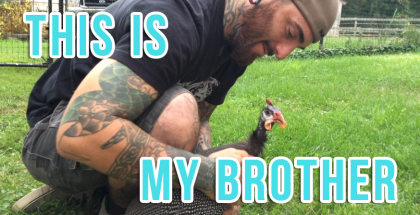 Buuuuut if you hear someone mention Vegan Treats and you think to yourself, “Oh, I love everything that is vegan and a treat,” or you realize they’re talking about an actual business and you’re still scratching your head… well, this intro is for you. 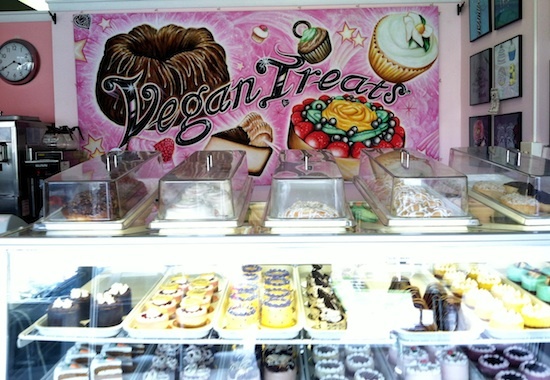 Vegan Treats is one of the premier vegan sweets providers in the country (IMO). They’ve built an amazingly strong (and rad!) brand, they distribute throughout parts of East Coast (particularly NYC and Philly), have this super radi rad store front, and are usually the highlight of any major veg event. 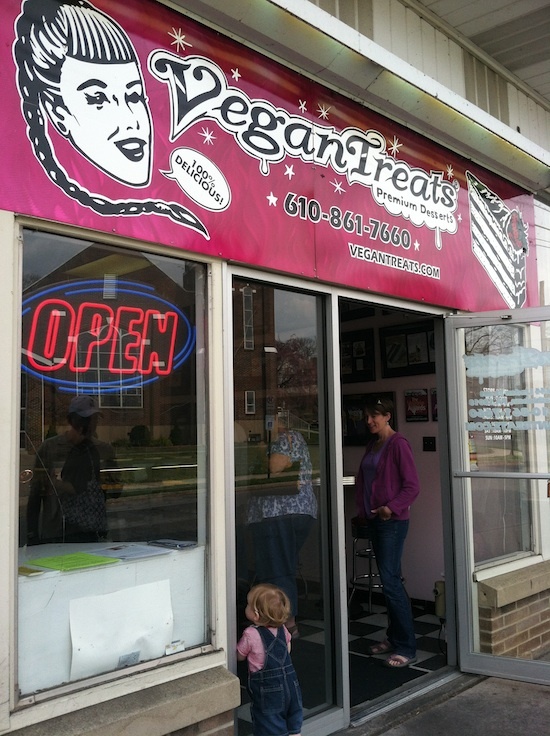 I don’t remember exactly when I first heard of Vegan Treats — I think my mom mentioned it at some point a few years ago — but what I do know is that I’d been dreaming of visiting their brick and mortar location for a very, very long time. I first fell in love with their marketing and their consistent brand messaging (50’s style flair) when visiting their website. Honestly, I’d spend hours just perusing the site…it’s so fun to live there! Um. Yeah. And I eventually had the opportunity to try some of their goodies at various veg festivals and of course, while in Philly. 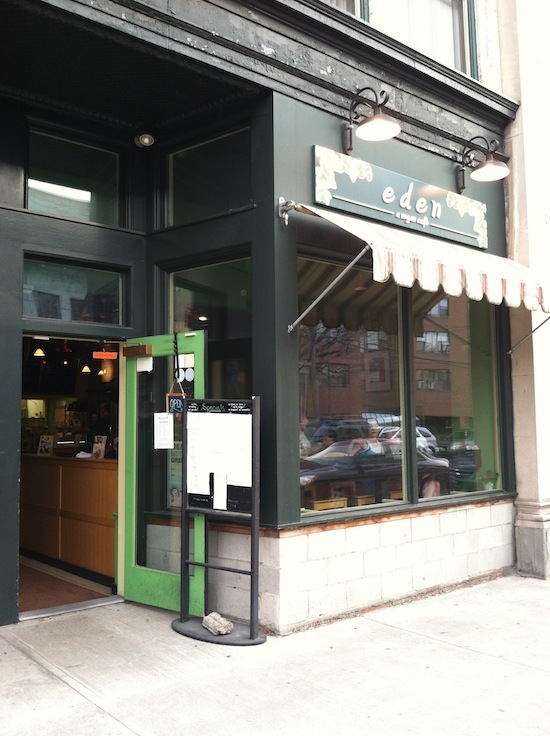 I ended up getting a few things to-go because I just had lunch and was headed to Scranton for dinner at Eden a Vegan Cafe. So I didn’t want to overdue it. 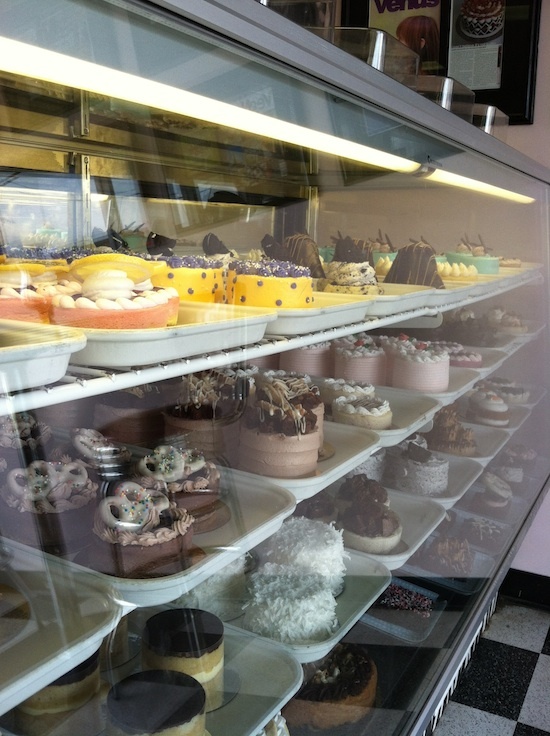 Besides, indulging in late night sweets sounded too good to pass up. It seriously took me at least thirty minutes to narrow it down to what I wanted to try. 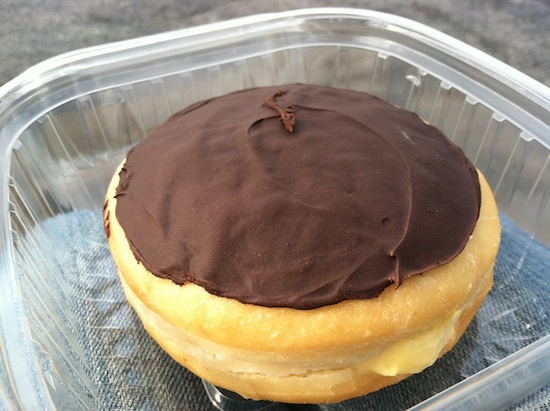 I went with the Boston Cream doughnut (never had one before…. ever! 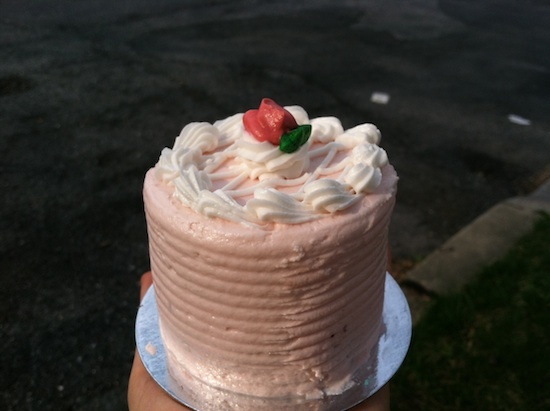 ), Strawberry Shortcake, and Death By Chocolate cake. 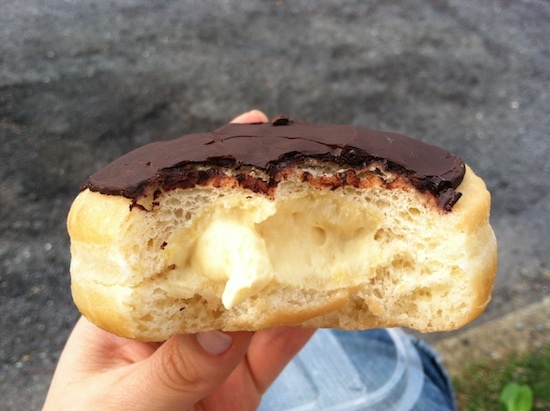 I had the ice cream AND the doughnut while strolling around the area, but saved the cakes for later!! Needless to say, everything was outstanding. 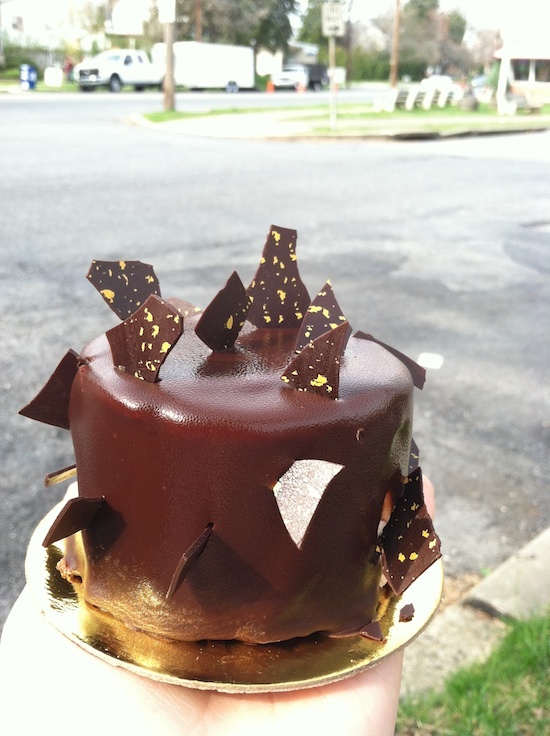 Vegan Treats absolutely makes some of the most consistently delicious and top of the line vegan sweets on the planet. No doubt. They’re by far, at the top of the vegan desserts game. As I was editing pics and trying to decide what to use for this post it occurred to me (again) how important brand messaging is. 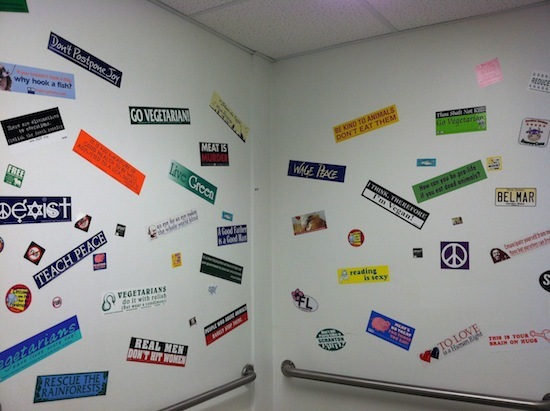 Everything from advertising to the displays in a store. I was having a hard time choosing photos not because I’m a great photog (I’m working on it!) but because the layout of products was awesome. The background colors were perfect, and it all worked together and made beautiful poetry. Perfect for the taking of pictures! This meant that a number of my pictures came out pretty well and it was mostly due to what I had to work with. This shop is set up for sharing. You see it. You want to capture it. And you want to share it. This is how businesses succeed (and last! 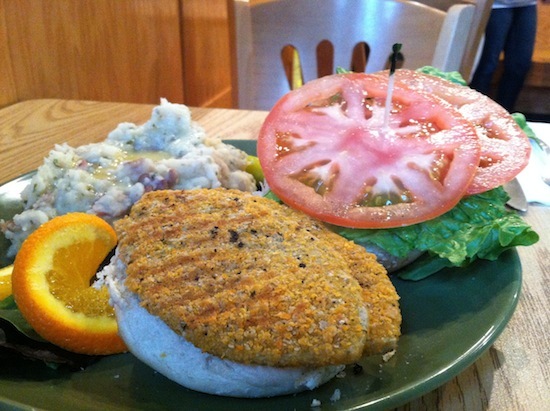 )… through word of mouth. Yes? Yes! If you own a business or are struggling with your messaging, just remember that people/customers/supporters/critics tend to only share “stuff” (pics, articles, blog posts, stories, etc.) that are AWESOME or TERRIBLE. They don’t share things that are just okay or average. So as you’re creating a brand or thinking about revamping yours, keep this in mind. Be consistent, be confident, and create stuff that goes above and beyond expectations. This stuff matters. Don’t skimp on your website (although there are cheap ways to work on this, no need to spend big buck-o’s on a site these days), or the decor of your store, or the content in your blog. Make it count. It might be the first and only impression you give a potential customer. After coming down from my Vegan Treats high I headed to Scranton, PA. Scranton is not only “home” to The Office (had to mention it…blargh!! 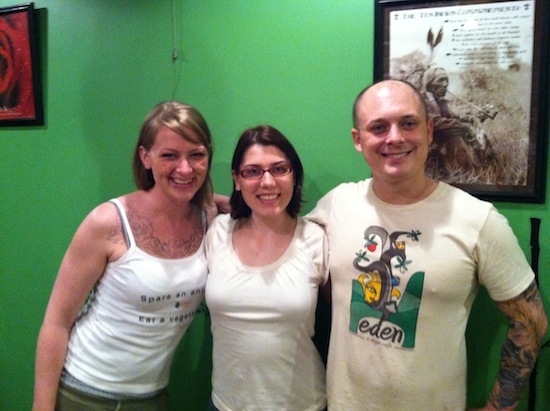 ), but it’s also home to a cozy little vegan cafe run by the super compassionate Christian Pilosi, and his wonderful fiancé, Maura Cummings. When I walked in I kinda felt like a few people were staring. But I figured I was just being a weirdo and making silly assumptions. 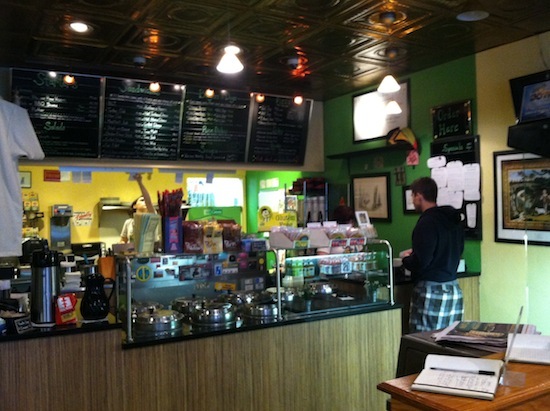 So, I walk up to the counter and chat with the woman working, trying to decide what to order. I kept making eye contact with one of the guys behind the counter. 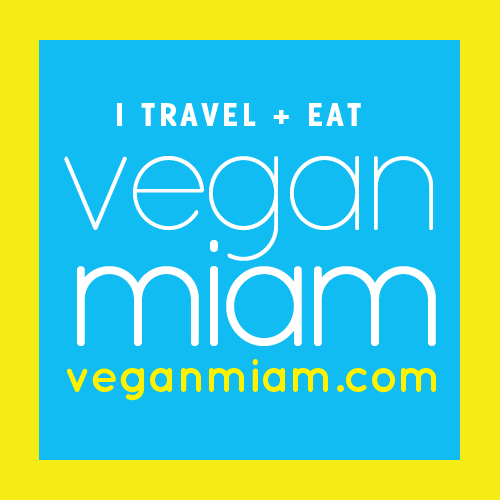 He finally came over and said, “Kristin…from Will Travel For Vegan Food?” Whaaat?!?! I probably turned twenty shades of red (and purple, from lack of oxygen) and said, “Yes!” It turns out, they were expecting me. I must’ve posted something to their Facebook page, I think? So they had a heads up, did their research, and had a “the eagle has landed” plan in place for my arrival. Sort of. Haha. Either way, I felt so super special and it was (still is) the first time a restaurant owner recognized me and made me feel super at home in a matter of seconds. Awesome stuff! 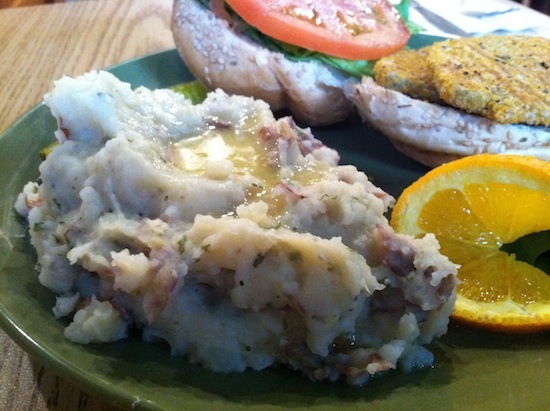 Upon recommendation from the staff, I had the fish fillet with a side of mashed taters. Deeelish! This “fish” is probably the closest thing to real fish I’ve had since going vegan. But without the stinky rotting flesh smell, and the pain, and suffering, and death, of course. While I was waiting for my order to come up I ran to the potty. And then I ended up spending a bit more time there than I was expecting. 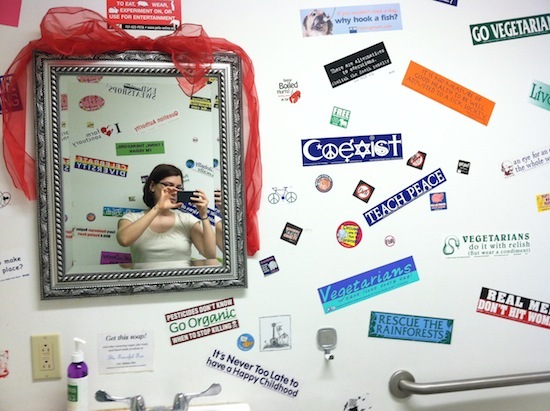 And not for obvious bathroom needs (don’t be gross… teehee) I was inspecting the walls because they’re COVERED in awesome stickers!!!!! 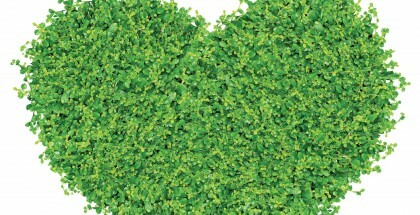 SEE!! 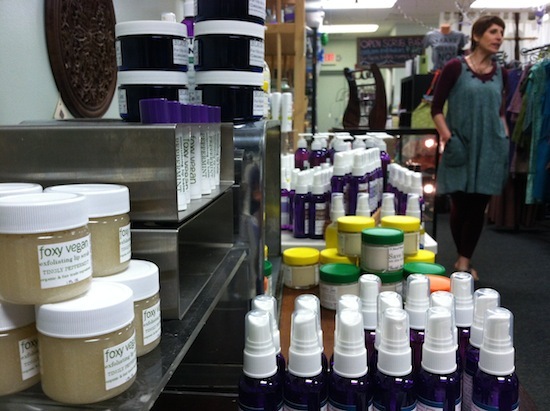 Before I left, Maura mentioned that there is a neighboring store which carries all-vegan products. Who knew?! So we took a walk over and I met one of the co-owners of this mother-daughter owned shop. 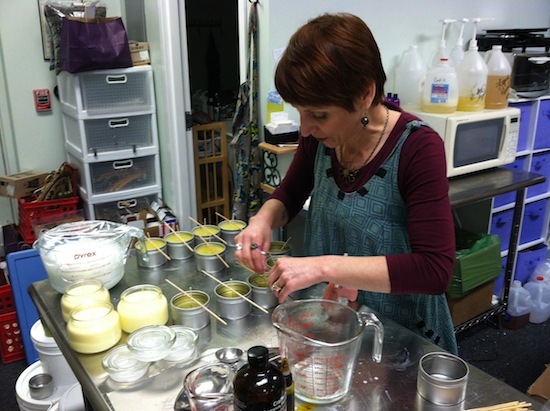 Kathie and Amanda Fox run The Fanciful Fox and they make their own vegan soap and candles. 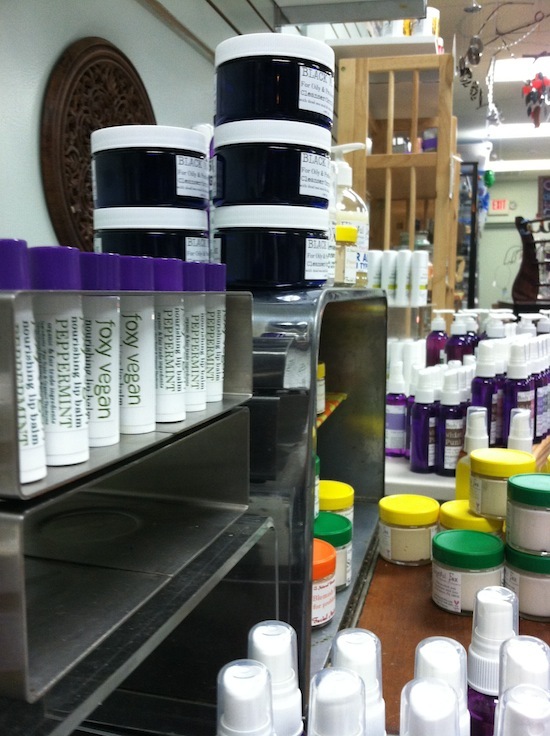 They also carry vegan stuff for home, babies, and bath and body care. You can buy in-store or through a whole sale provider. Neat-o!! 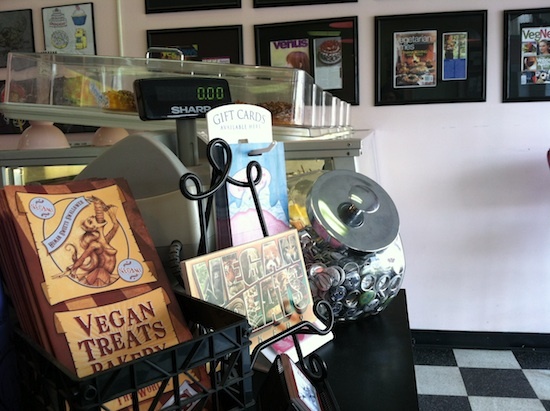 So … you know how I mentioned earlier that I got a few things to-go, from Vegan Treats? WeEEeEeelllll… I left the remaining sweets in the (unusually-warm-for-that-time-of-year) van while I drove from Bethlehem to Scranton, while I had dinner at Eden, and while I drove to where I was sleeping for the night. The treats were sitting in the van for probably 4-6 hours. I kept thinking about that chocolate cake and I couldn’t wait to have a few bites before going to bed. When I was finally ready to sleep, which this time also meant having at least one bite of those decadent sweets, I opened the box with the chocolate cake in it and without so much as glancing down, I took a big ol’ bite outta that sucker. 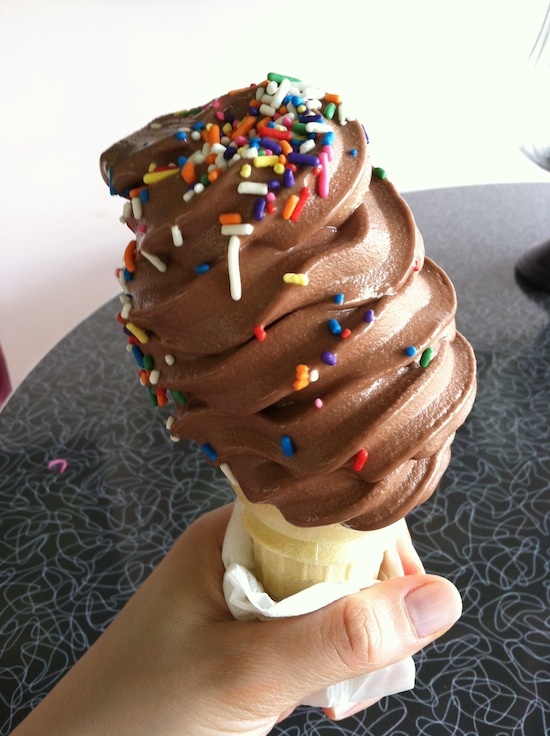 I closed my eyes and chewed slowly to take in ALL the flavorful goodness I could. As I was finishing the bite I looked down at the cake to plan my next move and saw…. gulp…. DOZENS of ants crawling around AND inside of the cake. I guess the lessons here are 1) get a sealed cooler for the van, 2) don’t leave sweets in the van…ever, 3) inspect food before consuming, and 4) ants love sugar. Duh! 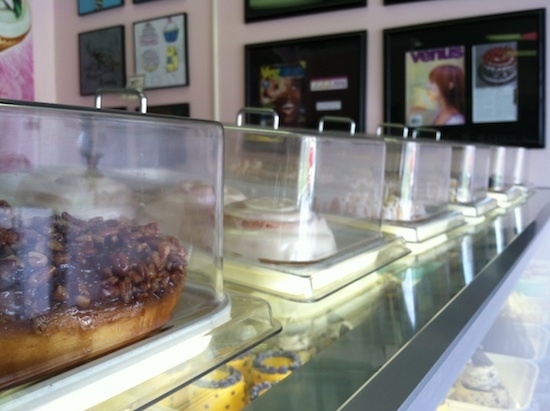 I want to go to Vegan Treats right now! Thanks for sharing! Sorry to hear about the ants getting your cake, I would have been super bummed. There’s always next time!! Yay! Bethlehem is my hometown and Danielle is a very good friend so I’m stoked you made it there! Hahaha I thought it was gonna be way worse. 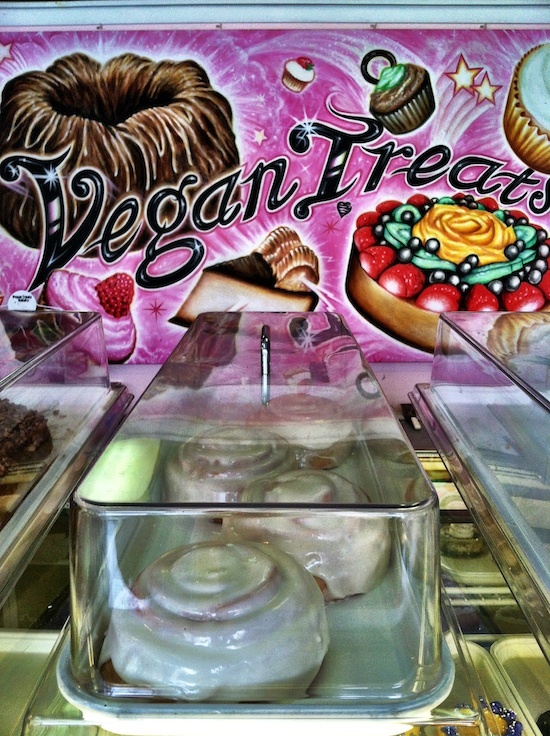 “vegan treats” is an awesome name. when I was like 15 I read an article about a skater who liked “vegan treats” and I had no idea what that even meant! Never ask them about processing soybeans so heavily and chemically altering them to the point that they call soybeans “ham”. They are REALLY touchy about that.